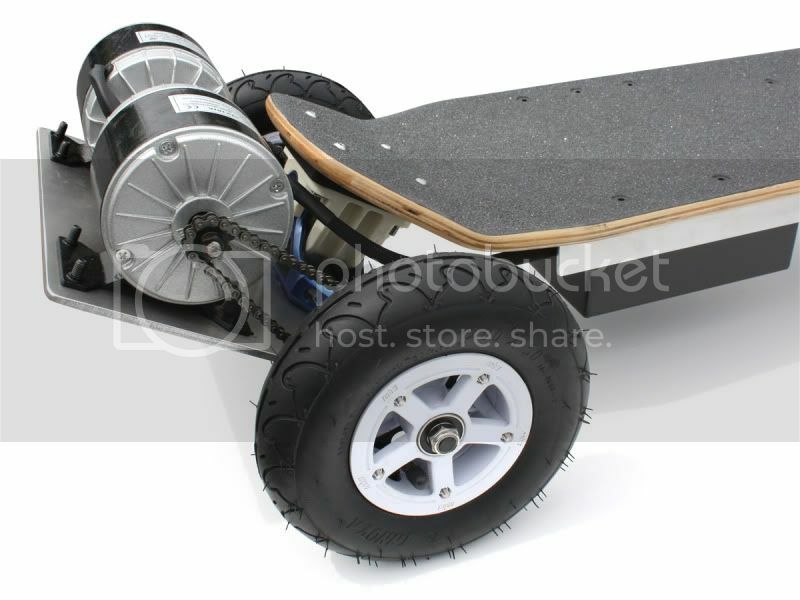 I've been researching a whole lot of different ways for me to go about making a gnarly 4wd skateboard. The issue I am running into now is that I can not find the correct motor-controller(s). I'm looking for a motor controller that offers Variable Regenerative Braking. The only problem w/ the above is that I would need Brushless motors if I wanted to use the 350 watt brushed motors that I can get a killer deal on. 2. Is there an inexpensive 350-400 watt brushless motor that can be direction reversed (2 of the 4 motors would need to spin in the opposite direction) and can also be externally controllable via the above linked controller? Thanks a bunch for any help. This school project is turning into a nightmare of back and forth research, so any help is appreciated. I can't quite tell from their specs if they allow a seporate input for regenerative braking or if they are just always braking when not accelerating. I also wonder why on earth they are 4.5 LBS? I wouldnt get too hung up about regenerative breaking - you really dont get that much back (maybe 2 or 3% and thats on a bike), and it Really wouldnt be worth it on a skateboard. Brushless motors are great, model plane out-runners can produce in the range of 500w, two of those (not 4) would be enough, and also they run off around 11volts so a 3 cell Lipo can be used which saves loads of weight. Thanks for the tips. The Regen isn't so much for efficiency, but more for the need to have brakes. mechanical brakes would not allow a dead-mans switch and would also add complexity to the design. I think Motor braking would be ideal in such a situation. 4WD is a design goal, already built a 2WD one, and 2WD was a hell of a lot better than the typical 1WD. So 4WD is likely to be a hell of a lot better than 2WD. Not the best logic, but this thing needs to be 4WD for design sake. I didn't get many questions answered here, but thanks Colin for responding. Dead-Mans break set at 20% if you fall off. very tight turning radius, I would guess 5 feet. total cost: Close to 1200 bucks. total build time: 1 full week. p.s. Regen braking works GREAT. It's the only way to go for a skateboard. And where did you take the photos, it looks like studio quality photography? So how does it perform, can you make a Youtube video of you demonstrating it!!? And the big question is Will you now be selling these? Lol! Thanks. I'm an Industrial Designer, and taking awesome photos is a pretty important part of design. These photos were taken on top of a large white foam-core board, outside, on a slightly overcast day. (overcast days are great days for taking photos). Smaller objects typically get shot inside a photo-box w/ 4 or 5 lights on 'em. I do not have any plans to manufacture this skateboard. I don't think there are enough people out there willing to fork out this kind of money! haha. But if someone has the $ and wants to contact me about it I've got no problem with that. But this one was built for the passion of building. I'll be sure to post a short youtube video once I get around to editing the footage (thats what takes forever). Above is the link to a youtube video of the 4WD Electric Skateboard in action. Awesome video, that kind of action with dust and gravel flying you drift round those coners is something Ive never seen from a skateboard before! If Visforvoltage had awards I think you ought to get 'innovation of the year' award! Thanks. I didn't really design it for off-road, but the 4WD sure is great for "surfing dirt". Did you have any issues with this? Many motors have their brushes adjusted with a timing offeset (the brush positions are advanced slightly to take account of inductive delays)- this makes them more efficient in one direction. The downside of this is that they are less efficient in Reverse. Im not sure if your motors were set at midpoint so they were equally fast in both directions? good question. To be honest I'm not sure. I know that the place I purchased them from said the polarity could be switched for reversing the motor direction, but that doesn't necessarily mean the motors were designed to do that. Ultimately it ended up not really mattering, because if there are any effects I don't notice them at all. It accelerates and decelerates evenly. And when you lift all 4 wheels off the ground and then accelerate they all start to spin at the same time. (but that's not telling me how "efficient" they are). Sorry I couldn't answer that question entirely. Yes, maybe these cheaper motors dont come with any 'Offset' and they are equally bi directional. More expensive motors do come with an offset, you gain about 10% in the forward direction, but lose 10% (in power and top speed) in the reverse. Maybe someone else can comment on whether the Chinese motors come non-directional as standard? Perhaps they're all to busy with their broken Vectix's to watch u burning rubber! Haha! I'd like to know as well. But either way it seems to work in this situation. another interesting thing is how I am running 4 motors off of just one controller. Some people would advise against that since you have a chance of frying your motors. But here is the benefit to running 4 (Brushed DC) motors (In parallel) off of just one controller: You get the ultimate traction. It's like having a positraction system on your vehicle and here is why: When 1 of the 4 tires loses traction, it's (motor) Amperage demand drops and the controller stops feeding it lots of amps and instead feeds the other 3 motors however many amps they are demanding. The end result is "amps only when you need 'em". 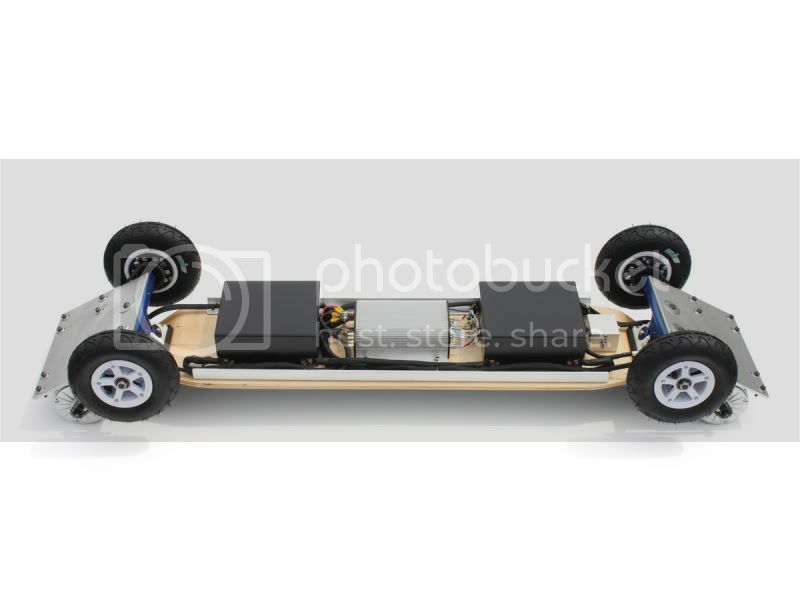 Now here is where it could be bad: If for some reason you lose traction on 3 of the 4 tires, and the 1 tire is stuck in a rut or something, then that 1 motor could "eat itself to death" by demanding too many amps, and the controller would have no problem supplying the extra amps since the other 3 motors aren't using them. If you were to run 4 motors in series w/ the motor controller (and battery-pack) you would get the opposite effect. When 1 of the 4 tires would leave the ground it would become the only tire spinning and the other 3 tires would lose all power. (like an open differential). So thats why I chose to just run a 24V system and 4 Brushed DC motors in parallel w/ a single Brushed DC motor controller. Can you run multiple sensorless brushless motors in parallel with a single brushless motor controller? No cant do it with Brushless motors because the controller uses feedback from the motor (either Hall sensors or back EMF) to phase the supply. Interesting point parallel vs series. The controller delivers the volts (lets say full speed 24v) and then the current will be divided in inverse ratios to the resistance of the motors. Faster turning gives more back EMF and equivalence of resistance - so as you point out the slower motors take a bigger share. Thanks for that info. I didn't know sensorless BL motors used back EMF. Learning something new every day. Looks like I'll be needing 4 speed controllers if I want to run 4 brushless motors in the future. I've noticed people claiming that the sensored BL motors perform better especially on start-up under a load (like starting from a stop on a skateboard), so I'll likely be looking for a sensored BL Motor Controller. 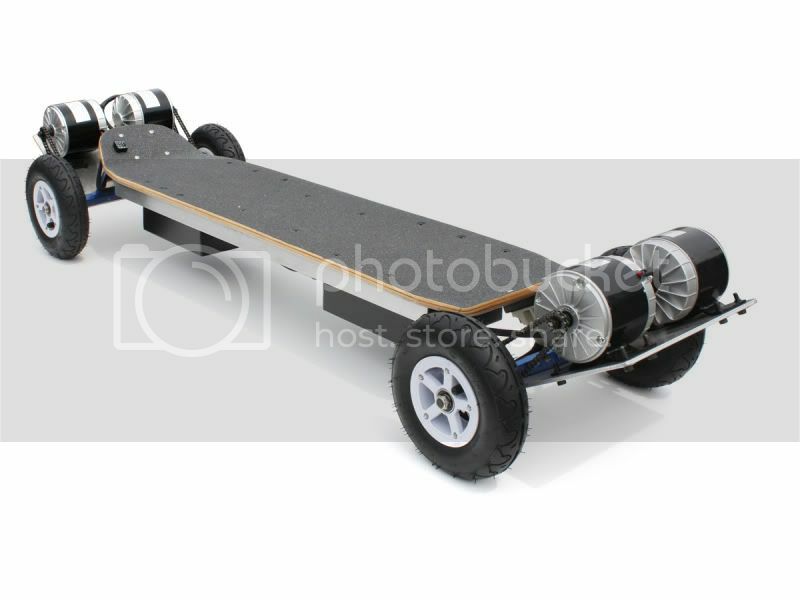 Josh i think the skateboard is really cool but i was wondering what motors, batteries and the controller did you use and where you brought as i would like to build something similiar. I used scooter motors (you can purchase 'em from any scooter supply store) , SLA batteries (12V 22AH) (you can purchase those anywhere, but i like "battery-spec" *worst looking website ever made, but lots of good info on it*) , Kelly Controller (this is the tricky part because Kelly's require two seporate inputs to work. Throttle and brake each need their own potentiometer. There are other "scooter" controllers that work but they dont typically give you variable braking. Good luck finding the correct combinations of parts. I'm sure there are a lot that will work together. ANy more questions shoot me an e-mail. joshpit2003 @ hot----.com. Wanting to try something much less ambitious. Was wondering if a brushless motor and controller for a larger RC truck might work? Thought to use a belt drive transmission line as seen in many commercially available skateboards. The systems I have been looking at seem to have impressive specifications. Controllers capable of handling large currents in tiny form factor. Motors designed to to work in hostile environments. Is there some obvious flaw in my thinking here? Would really appreciate some input. I have seen quite a few people use the RC parts. I would not advise it, as those motors and motor controllers are designed to push around 10 lbs, while you will be pushing around 150+ lbs. The main issue I have noted through other ppl using the RC stuff is the motors losing "sync", so many times you need to "baby" it up to about 5 mph, then you can start to use the full-power of the motor. But again, I have never built a skateboard using RC parts, so I may not be the guy to ask. As for the belt-drive... I hate it. Belt drive is notorious for "skipping", and thats because in order to put any decent power through a belt, it needs to be either SUPER-TAUGHT or SUPER-WIDE. And as you can imagine, a super-wide belt is a challenge to fit under a skateboard. Do yourself a favor and use ANSI 25 chain. It is very small, very fluid, and still able to apply a LOT of power w/o slipping or snapping. And as a side-note: chain-drive can be just about as quite as belt-drive if you do a good job aligning the sprockets and keeping the chain lubed. looks like I was not successful at embedding the video. where did you buy the batteries? Spacechariot provide you top quality & cheap self balancing real Hoverboards scooter . They are the top manufacturers of scooter by using the line materials delivering superior quality products.